May is National Bike Month, sponsored by the League of American Bicyclists and celebrated in communities from coast to coast. Established in 1956, National Bike Month is a chance to showcase the many benefits of bicycling — and encourage more folks to give biking a try. 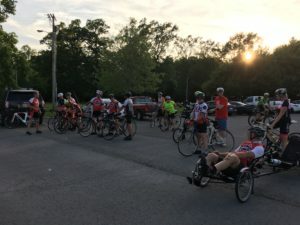 This entry was posted in Current Events, Ride Reports, The Right Side of the Road and tagged bike month, Ride of Silence on May 11, 2018 by juliah. Local cyclists have enjoyed several HRBike sponsored events related to Bike Month this May. The photo here is from the Wed., May 17 International Ride of Silence. Thanks to Hunter Norris for coordinating the ride. It was a very moving experience. 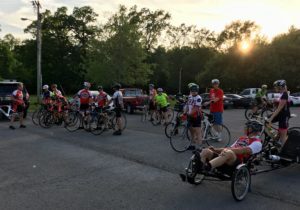 This entry was posted in Current Events, The Right Side of the Road and tagged Adopt a Hwy, bike month, Recycle Tullahoma, Wheels in Motion on May 22, 2017 by juliah. Bike Month has been filled with discoveries for me. So, what did you discover? Did you learn that you could actually ride up that mountain not just once but twice! Did you achieve your mileage goal for the month? Did you discover new products that are awesome? Here is a list a few things I learned this month. This entry was posted in Reviews, The Right Side of the Road and tagged bike month, commuting, ERV100, Gift Rocket, goals, Road ID, Tail lights on May 25, 2015 by juliah.